and the eggs are baked in the same pan. Sauté onion for a few minutes, just until softened. Add garlic and while stirring cook for about one minute. Add potatoes and sauté until softened. 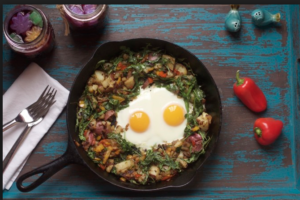 Put the hash into a cast iron pan, or start in one. Add arugula. Make a hole in the center. Make sure there is enough oil in pan. It doesn’t take too much, just a film of oil. Add eggs in the center. Bake in oven at 400 degrees F for 7-10 minutes or until eggs are set.